We are mobile friendly, take the community with you on the go! 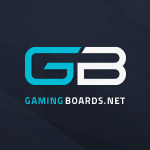 GamingBoards.net -- Where Gamers Unite! Gaming is better with friends..
Register and connect with a great community of gamers! Hm.. what to play next? Prepare for battle! ..Or just hang out, we're cool with that too. Meeting Gamers has never been so easy! We've personally set a bounty on campers, lock and load. Sleep or keep gaming with friends? Ah, who needs sleep anyway. You've never seen rage until you've AFK'ed during a raid. What makes GamingBoards.net unique? Our diverse community. So you're here for some new gamer friends? We got you fam. Don't just lurk, share your story and meet new friends! Seriously, are you just going to stand there? We've got zombies to kill. Register! Let's be honest.. gaming is WAY better with GOOD friends. Oh, so you have skill? Show us! Register, Post, Connect, and SHARE! Game on soilder, we've got your back. Want to see only certain threads in a board? Click the thread label such as 'review' to filter. Can't find what you're looking for? Try the search feature in the top right. Our Discord sidebar(right of page) will only display if your monitor/resolution can support it. Try out the Dark/Light mode switch by using the teal button to the right of your page, enjoy! This is GamingBoards.net -- Where Gamers Unite. All things related to gaming on the PC Whether you're a pro or newbie, this is where PC gamers unite. PlayStation™, Xbox™, Nintendo™ Staying up to date with the latest console gaming news and finding new friends has never been easier. Android, iOS, and Windows Gaming on the go. What's your favorite oldie? We're bringing back the classics. With age comes true beauty, blast to the past and discuss your favorite oldies. Will we ever see another Duke Nukem Game? Going beyond gaming The coffee's hot and we're going beyond gaming. Welcome to our off-topic discussions. Question, Comment, Concern, Feedback? Seeking assistance? Look no further.